Part of my research into Material & Emotional Values. The LED Sundial is a conventional timepiece that reflects the cyclic nature of the world around us. In our technology obsessed lives we need a reminder of the forces that define our days and nights – the sun and moon. 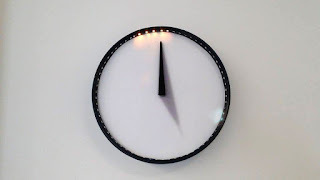 The wall clock takes the form of a traditional sundial, where the sun and moon are represented by LEDs set into the frame of the clock. As the sun moves throughout the day, the LED sun moves around the outside of the clock, casting a shadow onto the hour position. As the sun rises and sets the LEDs change colour, simulating sunset. During the night, the moon becomes the time keeper as it rotates around the clock. The LED cycles are set to mimic the natural solar and lunar cycles over Manchester. At this time of month, the moon rises early in the day, shines with the sun and sets at around midnight. This natural progression is replicated in the clock, meaning that at certain times of year, the moon will eclipse the sun and the clock will cast no shadow. We often feel very disconnected to nature, and the LED Sundial is designed to ground you and gently remind you about the outside world. Visually, the LED Sundial was naively inspired by Jasper Morrison’s Superloon light, and the recent works of Nendo – naively in a sense that I found them to be some of the most inspiring works I saw while in Milan, and though I came about my project from an entirely different route, my design somewhat echoes the visuals of these works. 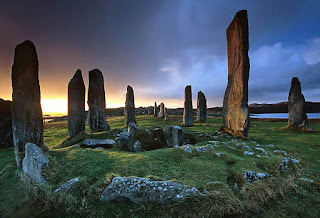 From a personal level, I have had a fascination with cosmology for a long time, and am constantly inspired by the natural cycles of the world and how humans have interacted with them throughout history. The face of the clock and simple black gnomon were inspired by the Callanish stones in the Outer Hebrides – a Neolithic stone circle designed to align with the moon during a lunar standstill that happens once every 18 years (Astrocal, 2007). My aim is to continue to develop this product as part of my Final Major Project, looking more broadly at the subject of time and our perceptions of it.